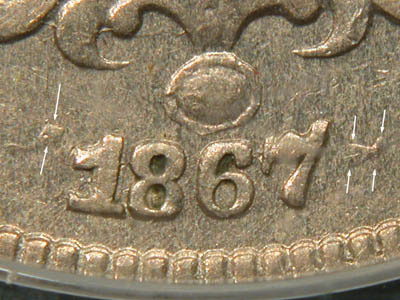 This 1867 with rays is unique among shield nickel varieties for having an extremely wide-spaced triple-punched date in two different directions. One date was punched far left and one date was punched far right before the final date was correctly entered in a central location. Not recorded by Breen, but well known among shield nickel enthusiasts. Note: It is possible but unconfirmed that this die is actually a dual logotype (two different size dates) variety. Both the flat part at the top of the repunched 1 and and curved portion of the repunched 1 look longer than the primary 1. If that's really true, then maybe this is the top small date over large date variety instead! Update! Recent research has shown that it is very likely that this variety resulted from a shield nickel date logotype punched over a seated liberty dime date logotype.